Junichiro Hironaka, the lawyer for Carlos Ghosn, speaks during a press conference after Ghosn's rearrest during release on bail, April 4, 2019 in Tokyo. In an unprecedented turn of events, Carlos Ghosn has been rearrested less than a month after being released on bail in Tokyo. The Tokyo District Court gave approval for Carlos Ghosn to be detained for 10 days in a Tokyo detention center, marking his fourth arrest in Japan. The former chairman of Nissan will remain behind bars until April 14 for allegedly channeling Nissan company funds totaling about $5 million to personal and family bank accounts via a Nissan sales dealer in Oman. Prosecutors claim Ghosn was involved in a bogus business — illegally transferring Nissan remittances to Middle Eastern car dealers for personal use, causing Nissan to lose money. Sources say that since 2009, Omani car dealer Suhail Bahwan Automobiles (SBA) has received about $31 million dollars for sales promotion incentives from a Nissan CEO reserve fund, which Ghosn could use at his discretion. An Indian executive in charge of accounts at SBA was headhunted by Ghosn 10 years ago to manage and head Lebanese investment firm Good Faith Investments (GFI), effectively owned by Ghosn. The executive has told people close to him that he was instructed not to touch the money sent from Nissan, which was explained by Ghosn as a subsidy from the company. Prosecutors say they have found internal Nissan documents, including suspicious emails, showing sums of money were distributed to GFI, then funneled to multiple family members’ bank accounts. According to the allegations, money went to Carole Ghosn’s beauty brand Yacht Beauty and Ghosn’s son’s California-based investment firm Shogun, which he heads as CEO. The prosecutors’ special investigation unit has sent a team to the United States to begin analyzing Shogun’s financial transactions through U.S authorities. Ghosn has denied the allegations, calling the new arrest “outrageous.” His defense lawyers slammed the court’s decision as unfair, since there was no fear of him escaping or destructing evidence. Ghosn’s high-profile defense lawyer, Junichiro Hironaka, spoke to reporters on Thursday after visiting Ghosn at the Tokyo Detention Center. He condemned Ghosn’s detainment as “unnecessary” as the former CEO is on bail under strict conditions. 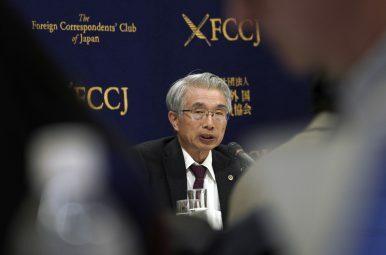 Hironaka also fiercely criticized the seizure of a number of unrelated documents connected to an overseas lawsuit as an infringement of rights. While Ghosn’s imminent rearrest was widely speculated on by the media, he was apparently not expecting the doorbell to ring as early as 5:50 a.m. on Thursday. Japanese media reports that Ghosn and his wife Carole were reprimanded in their pajamas by some 20 officials. Carole, 52, has accused Japanese prosecutors of treating her like a “terrorist.” She complained in a New York Times interview of having her home and personal items seized, individually examined, and photographed, including her phone, passport, diary, and purse. Her credit cards and membership cards to U.S. drug stores were also photographed. One of Ghosn’s initial bail conditions required constant video monitoring. However, Carole fiercely criticized prosecutors’ instructions to turn off the camera in the house during the interrogation and house search. Even by Japan’s judicial standards, it’s unusual for a defendant who was released on bail in a special investigation to be detained again. The prosecution’s treatment of Ghosn has led to a barrage of overseas media criticism of Japan’s judicial system. Ghosn’s arrest comes a day after he made a surprise Twitter announcement saying he would hold a press conference on April 11 to reveal “the truth on what has happened.” Ghosn’s defense team believe his detainment is intended to prevent Ghosn from speaking out. After 108 days of detention, ousted Nissan CEO Carlos Ghosn’s dramatic, disguised exit has taken the media spotlight. Does Ex-Nissan Chief Carlos Ghosn’s Detainment in Japan Point to Human Rights Abuse? Is Nissan a Japanese Company?Fall From Grace: Nissan CEO Carlos Ghosn Faces Financial Misconduct Charges in JapanUS-Japan Trade Agreement Negotiations: Why Now?Is Japan Anti-China?